I am an ordained minister from the London Interfaith Seminary and abide by individual and group vows taken to become a minister. I abide by the code of ethics of the graduate body of the Interfaith Seminary. 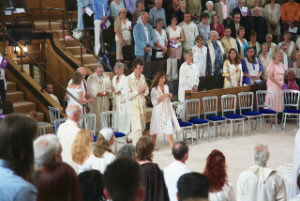 I was ordained in August 2008 in London. The interfaith seminary is part of a growing movement whose aim is to serve all those who are not formally religious but still retain a strong spiritual or God focussed orientation. I was born and brought up in Hong Kong and returned to live there in 1997. I am a Findhorn Fellow. I am currently a supervised student in the Process Oriented Psychology in UK school and see clients in Hong Kong and offer talks and workshops as a therapist worldwide. I am based in Hong Kong, and am frequently in Australia, South Africa and UK. I am happy to conduct ceremonies anywhere, especially in Asia and have celebrated weddings in Hong Kong and Bali. I have dual British-Australian citizenship. In February 2010 I became an Australian Marriage Celebrant, and have learnt a lot from the training especially how to honour ceremony and secular ceremonies. Update – 2015, i am no longer registered as a legal celebrant in Aus, but the training was helpful. As far as I know, I am the only interfaith minister in Asia.